ExoFit STRATA™ features our exclusive LIFTech™ load distribution system, it takes the weight off your shoulders and redistributes it down to your hips. Additionally, PolarMesh™ padding delivers advanced breathability, and the EZ-Link™ quick SRL adapter simplifies connecting and disconnecting your personal SRL like Nano-Lok™. If your safety harness is weighting you down, Lighten Up with the ExoFit Strata™. Still using a lanyard? The 6 ft. Rebel™ SRL is the perfect way to upgrade. You get an economical fall protection solution that minimizes your fall clearance requirements. Don’t compromise on safety: maximize the performance of your crew, while ensuring full compliance. Built tough, worn in comfort! The newly-designed Delta™ Comfort Harnesses are as tough as those who wear them. These models incorporate many of the popular features of the original Delta™ in addition to built-in shoulder, back and leg comfort padding. The padding wraps around you and incorporates vent windows allowing direct air contact and better circulation cooling the body. Today's generation of harnesses address all the key needs of the worker: comfort, ease of use, and durability. Features such as locking quick-connect buckles and innovative torso adjusters help eliminate the need to make adjustments during the day. State of the-art breathable mesh padding and lightweight aluminium components ensure worker comfort. Strategic use of fabrics and plastics in wear areas, plus moisture- and abrasion-resistant webbing help to increase the life of the harness and the overall satisfaction of the user. Click here for more. 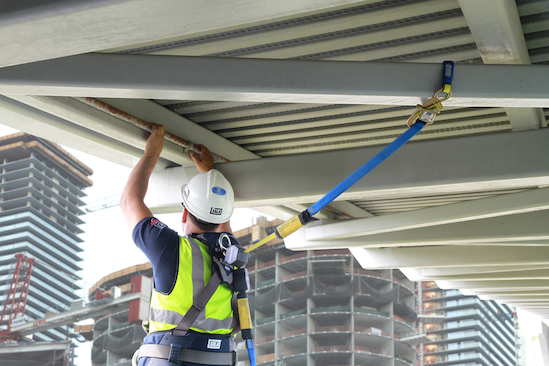 Full-body safety harness designed and tested with third-party research offers real, measurable comfort and safety for at-height workers.